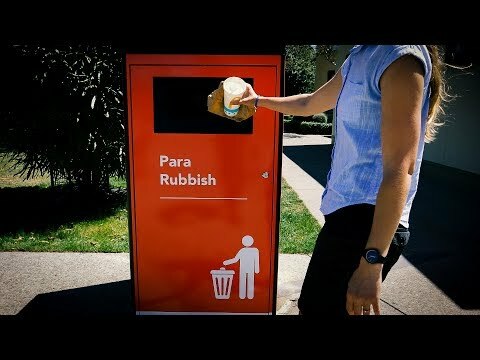 A trial is underway in Palmerston North to see whether compacting solar rubbish bins are more effective and efficient than some of our current bins in public parks. Have you spotted our new smart bins? One bin can hold 32 times as much rubbish as our other bins! Palmerston North City Council has installed three bins – one each at Milverton Park, the Square, and the Skate Park. The large red bins can hold up to 1,920 litres of material, compared to the 60 litres our normal park bins can deal with. A solar panel on the top of the bin provides the power for the compaction, with a sensor which sends notifications to our team on the bin’s status – such as fill level. When the bins are getting full an alert will be sent to Council to say it’s time to empty them. Currently, our waste staff empty bins on a schedule and that often means they’re emptying bins that aren’t full, or not getting there before they overflow. We’ll be able to save a lot of time on our routes if we only need to empty full bins. We’ve specifically ordered bins with an open aperture, like a post box hole, so you don’t have to touch the bin to place your rubbish inside. We’ve chosen the three parks for the trial because they cater for very different groups of people and we want to see whether they’re used differently. Milverton Park, on the corner of Victoria Ave and Ferguson Street, is a family hotspot. We currently have 13 bins in the park, but this one solar bin is able to hold more than all of them combined. We’ll see how people respond to the solar bin during the early stages of the trial before deciding whether to remove the others. Another solar bin is in the Square, near the carpark by the bus terminals. This area is widely used by visitors to the city, and also home to many events. We chose the Skate Park because it has a high number of young people and we want to see whether they relish this new technology or prefer the older style bins. The trial will last six months. Council will review the bins’ effectiveness and efficiency before deciding whether to trial their use in other locations.